WE GREW OUT OF INSPIRATION TO SOURCE HIGH QUALITY MEATS COOKED OVER AN ALL WOOD FIRE. 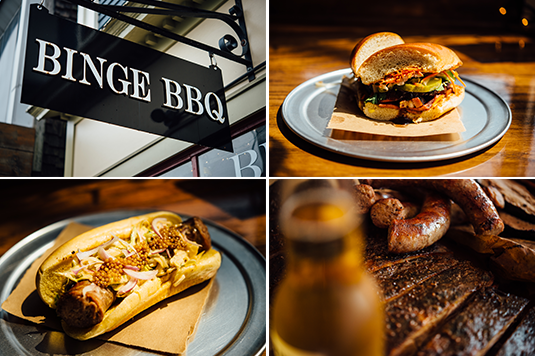 Binge is a 30-seat, BYOB counter service restaurant providing dine in, take out and delivery. 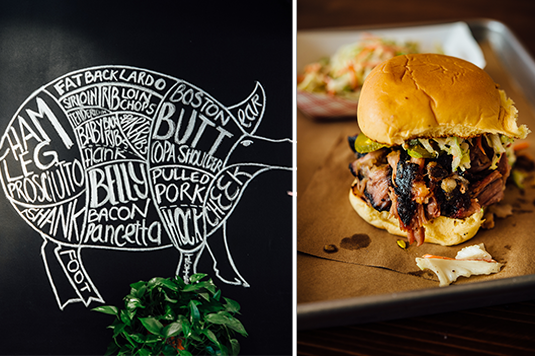 We cook regional barbeque with inspiration from a variety of areas across this great country of ours. We house a horizontal smoker where all meats are prepped and smoked on site daily at the restaurant. Everything made in-house. Ingredients from local farmers markets. Highest-grade meat available. In February of 2016 our team built a custom offset smoker out of an old 500 gallon propane tank and scrap metal. We offer a wide variety of options for catering utilizing our on-site smoker as well as a fully equipped kitchen. We work closely with each client to create a custom menu and unique experience. We’ve vended at events like PVD Fest, Ocean State BBQ Fest, Newport Folk and Jazz Fest, as well as block parties, graduations and company events.